Its largest one before this was a toaster-sized electronics enclosure. Lockheed Martin has just finished the final series of quality control tests for an enormous titanium dome meant to serve as caps for satellite fuel tanks. It's not just any ordinary dome, though: the enormous component measures four feet in diameter and is the company's biggest 3D-printed space component to date. Its previous largest qualified space part is an electronics enclosure that's around the size of a toaster. 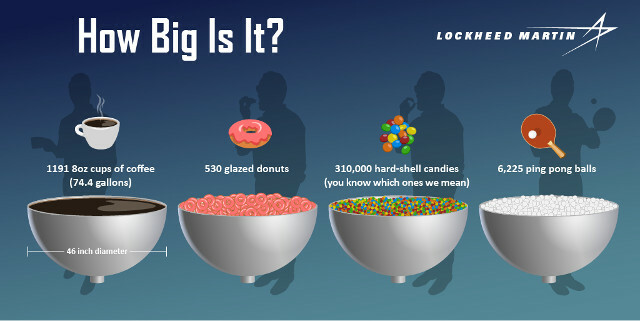 This dome is large enough to seal fuel tanks bigger than humans and, according to Lockheed Martin, big enough to hold 74.4 gallons of coffee or 530 donuts. Glazed, of course. Titanium is an ideal material for the industry, because it's lightweight and can withstand the harsh conditions of space travel. However, manufacturers end up wasting 80 percent of the material using traditional manufacturing techniques -- plus, each component could take years to build. Rick Ambrose, the company's executive VP, said they were able to cut down the total delivery timeline for a titanium fuel tank dome from two years to an incredibly impressive three months. "Our largest 3D-printed parts to date show we're committed to a future where we produce satellites twice as fast and at half the cost." 3D printing has the potential to transform the space industry by giving contractors a way to build spacecraft more quickly and for a much smaller amount of money. In fact, Lockheed Martin plans to build NASA's Orion crew capsule with 100 3D-printed parts, while Boeing announced way back in early 2017 that its Starliner space taxi will have over 600.